Chapter 5: Customers, Products, Services . . . . . . . . . . . . . 129 Close Customer Relations . . . . . . . . . . . . . . . . . . . . . . . . . . . . . . . . . . 130 Customer Requirements. . . . . . . . . . . . . . . . . . . . . . . . . . . . . . . . . . . . 134 Dependence on the Customer and Risk Aspects . . . . . . . . . . . . . . . . . 135 Achieving Closeness to Customer . . . . . . . . . . . . . . . . . . . . . . . . . . . . 139 Product and Service Spectrum . . . . . . . . . . . . . . . . . . . . . . . . . . . . . . . 144 Summary. . . . . . . . . . . . . . . . . . . . . . . . . . . . . . . . . . . . . . . . . . . . . . . . 156 Chapter 6: Innovation . . . . . . . . . . . . . . . . . . . . . . . . . . . . . . . . . . 159 What Does Innovation Mean?. . . . . . . . . . . . . . . . . . . . . . . . . . . . . . . 159 High Level of Innovativeness . . . . . . . . . . . . . . . . . . . . . . . . . . . . . . . . 163 Driving Forces of Innovation . . . . . . . . . . . . . . . . . . . . . . . . . . . . . . . . 172 The Origin of Innovations. . . . . . . . . . . . . . . . . . . . . . . . . . . . . . . . . . 176 Leadership and Organizational Aspects of Innovation . . . . . . . . . . . . 179 Summary. . . . . . . . . . . . . . . . . . . . . . . . . . . . . . . . . . . . . . . . . . . . . . . . 187 Chapter 7: Competition . . . . . . . . . . . . . . . . . . . . . . . . . . . . . . . . 191 Competitive Structure and Conduct . . . . . . . . . . . . . . . . . . . . . . . . . . 191 The Hidden Champions in the Light of Porter's "Five Forces" . . . . . 195 Competitive Advantages. . . . . . . . . . . . . . . . . . . . . . . . . . . . . . . . . . . . 197 Sustainability of Competitive Advantages . . . . . . . . . . . . . . . . . . . . . . 203 Demonstration of Competitive Superiority . . . . . . . . . . . . . . . . . . . . 205 Competitive Edge and Costs . . . . . . . . . . . . . . . . . . . . . . . . . . . . . . . . 207 Sparring Partners for Competitive Fitness . . . . . . . . . . . . . . . . . . . . . . 214 Excessive Competitive Orientation . . . . . . . . . . . . . . . . . . . . . . . . . . . 217 Summary. . . . . . . . . . . . . . . . . . . . . . . . . . . . . . . . . . . . . . . . . . . . . . . . 218 Chapter 8: Financing, Organization, and Business Environment . . . . . . . . . . . . . . . . . . . . . . . . . . . . . . . . . . . . . . . . . . . 223 Financing . . . . . . . . . . . . . . . . . . . . . . . . . . . . . . . . . . . . . . . . . . . . . . . 224 Organization . . . . . . . . . . . . . . . . . . . . . . . . . . . . . . . . . . . . . . . . . . . . . 228 Contents ix Organization of the Value Chain . . . . . . . . . . . . . . . . . . . . . . . . . . . . . 237 Business Environment . . . . . . . . . . . . . . . . . . . . . . . . . . . . . . . . . . . . . 249 Entrepreneurial Clusters. . . . . . . . . . . . . . . . . . . . . . . . . . . . . . . . . . . . 251 Summary. . . . . . . . . . . . . . . . . . . . . . . . . . . . . . . . . . . . . . . . . . . . . . . . 253 Chapter 9: Employees . . . . . . . . . . . . . . . . . . . . . . . . . . . . . . . . . 257 Job Creation . . . . . . . . . . . . . . . . . . . . . . . . . . . . . . . . . . . . . . . . . . . . . 257 Corporate Culture . . . . . . . . . . . . . . . . . . . . . . . . . . . . . . . . . . . . . . . . 260 Quali?cations and Learning . . . . . . . . . . . . . . . . . . . . . . . . . . . . . . . . . 274 Creativity of Employees . . . . . . . . . . . . . . . . . . . . . . . . . . . . . . . . . . . . 278 Recruiting . . . . . . . . . . . . . . . . . . . . . . . . . . . . . . . . . . . . . . . . . . . . . . . 279 Summary. . . . . . . . . . . . . . . . . . . . . . . . . . . . . . . . . . . . . . . . . . . . . . . . 282 Chapter 10: The Leaders . . . . . . . . . . . . . . . . . . . . . . . . . . . . . . . 285 Structures of Ownership and Leadership . . . . . . . . . . . . . . . . . . . . . . 286 How Crucial Is Leadership? . . . . . . . . . . . . . . . . . . . . . . . . . . . . . . . . . 289 Leadership Continuity . . . . . . . . . . . . . . . . . . . . . . . . . . . . . . . . . . . . . 289 Young to the Top . . . . . . . . . . . . . . . . . . . . . . . . . . . . . . . . . . . . . . . . . 293 Powerful Women . . . . . . . . . . . . . . . . . . . . . . . . . . . . . . . . . . . . . . . . . 294 Internationalization of Management . . . . . . . . . . . . . . . . . . . . . . . . . . 298 Personalities . . . . . . . . . . . . . . . . . . . . . . . . . . . . . . . . . . . . . . . . . . . . . 300 Leadership Styles . . . . . . . . . . . . . . . . . . . . . . . . . . . . . . . . . . . . . . . . . 305 Management Succession . . . . . . . . . . . . . . . . . . . . . . . . . . . . . . . . . . . . 306 Summary. . . . . . . . . . . . . . . . . . . . . . . . . . . . . . . . . . . . . . . . . . . . . . . . 310 Chapter 11: Hidden Champions: Audit and Strategy Development . . . . . . . . . . . . . . . . . . . . . . . . . . . . . . . . . . . . . . . . . . 315 What Is Strategy? . . . . . . . . . . . . . . . . . . . . . . . . . . . . . . . . . . . . . . . . . 316 Hidden Champion Strategy: For Whom? . . . . . . . . . . . . . . . . . . . . . . 316 Hidden Champions - Audits . . . . . . . . . . . . . . . . . . . . . . . . . . . . . . . . 317 Strategy Development . . . . . . . . . . . . . . . . . . . . . . . . . . . . . . . . . . . . . 325 Strategies for Value Propositions and Pricing . . . . . . . . . . . . . . . . . . . 335 Organization and Implementation . . . . . . . . . . . . . . . . . . . . . . . . . . .
Illustrations note 91 Illustrations, black and white; XVI, 402 p. 91 illus. What do Tetra aquarium supplies, Elector-Nite sensors, and Nissha touch panels have in common? They are typical "hidden champions," medium-sized, unknown companies (with annual revenues under $4 billion) that have quietly, under the radar, become world market leaders in their respective industries. Hermann Simon has been studying these hidden champions for over 20 years, and in this sequel to his worldwide bestseller, Hidden Champions, he explores the dramatic impact of globalization on these companies and their outstanding international success. Going deep inside more than a thousand hidden champions around the world, Simon reveals the common patterns, behaviors, and approaches that make these companies successful, and, in many cases, able to sustain world market leadership for generations, despite intense competition, financial pressures, and constantly evolving market dynamics. In the tradition of In Search of Excellence, Built to Last, and Good to Great, Simon identifies the factors in business operations, customer service and marketing, innovation, human resources management, organizational design, leadership, and strategy that separate these outstanding performers from the rest of the pack - and from the large corporations of the day. In the process, he provides a glimpse behind the curtains of many secretive companies who buck today's management fads, and succeed instead through such common-sense strategies as focusing on core capabilities, delivering real value to the customer, establishing long-term relationships, innovating continuously, rewarding employees for performance, decentralized operations, and developing an unparalleled global presence. Hidden champions teach us that good management means doing many small things better than the competition--quietly, with determination, commitment, and never-ending stamina. And in turbulent economic times, the hidden champions represent an antidote to the short-sighted and excessive practices that have brought many corporate giants crashing down. The hidden champions provide invaluable lessons for all stakeholders in the business community, from entrepreneurs to corporate managers, investors to employees, union organizers to regulators, advanced and emerging countries and may well serve as the new role models for sustainable economic growth in the globalized world of the future. 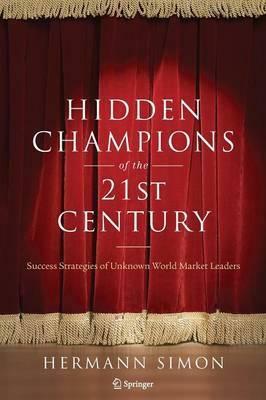 The Mystique of the Hidden Champions.- Growth and Market Leadership.- Market and Focus.- Globalization.- Customers, Products, Services.- Innovation.- Competition.- Financing, Organization, and Business Environment.- Employees.- The Leaders.- Hidden Champions: Audit and Strategy Development.- The Lessons of the Hidden Champions. Hermann Simon is Chairman of Simon-Kucher & Partners, Strategy & Marketing Consultants, with 18 offices in Europe, Asia, and the United States. He is an expert in strategy, marketing and pricing, advising clients and speaking to business organizations worldwide. Prior to taking on consulting full-time, he was a professor of business administration and marketing at the Universities of Mainz and Bielefeld, and has served as a visiting professor at many universities, including Harvard Business School, London Business School, INSEAD, Keio University, Stanford, and MIT. Named one of Europe's most influential management thinkers, he has served on the boards of numerous journals, including the International Journal of Research in Marketing, Management Science, and European Management Journal, and has published over 30 books, including the worldwide bestseller, Hidden Champions (1996), Power Pricing (1997), and Manage for Profit, Not for Market Share (2006).